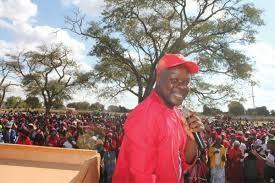 MDC national organising secretary Amos Chibaya has rubbished government claims that the opposition party was behind the current protests sparked by last week’s steep fuel price hikes. “Here in Gweru, I saw very senior Zanu PF officials and activists protesting as well. I am the organising secretary of MDC and all programmes come from my office. I never sanctioned these protests at all; that is why I am here at home. Our own programmes will come,” Chibaya said. “The government must simply listen to the message being delivered to it by its people instead of laying blame on the MDC. We are saddened by the people who have already been shot and killed by the State security agents. The regime has been cornered. It’s a complete humiliation for the so-called new republic. Chibaya said he did not activate the so-called Vanguard or the Democratic Resistance Committee as claimed by State security minister Owen Ncube. “I am not aware of any co-ordination for these protests. What is clear is the long-suffering of Zimbabweans. President (Emmerson) Mnangagwa must address the burning nation and end his shameless globetrotting,” he said. Zanu PF spokesperson Ambassador Simon Khaya Moyo declined to comment on the matter. “No comment. He should report what he knows to the police,” Khaya Moyo said.